Tornado touchdowns reported in west-central Minn.
A tornado touched down in the west-central Minnesota town of Spicer late Tuesday afternoon, causing damage at a shopping mall, while another tornado also went through the small town of Swift Falls, where it destroyed a couple of turkey barns. Law enforcement reported a tornado on the ground in Spicer about 4:40 p.m. Branches were reported down throughout the south end of Spicer, and roofing and siding appeared to be ripped off of Green Lake Mall. Damage was also reported at a ballpark. Reed Anfinson, publisher of the Swift County Monitor, said the tornado that hit Swift Falls destroyed two turkey barns and knocked down trees and power lines. There were no immediate reports of injuries in either community. Swift Falls is about 25 miles northwest of Spicer, which is about 80 miles west of Minneapolis. Ed and Linda Sluka, who live about a half-block from the mall, said they didn't see the tornado that hit Spicer, but they did see heavy rotation in the clouds. They told The West Central Tribune of Willmar that they were in their garage when warning sirens went off. The Slukas went out for a quick look before they took shelter. "We didn't want to stick around for the show," Linda Sluka said, so they didn't see the touchdown, but they could hear trees breaking and other noise. Jeff Karnes, manager of the Little Crow Sports Center in Spicer, told the Star Tribune of Minneapolis that the tornado appeared to be about a quarter-mile wide as it touched down crossing Green Lake, overturning some boats and causing minor property damage. 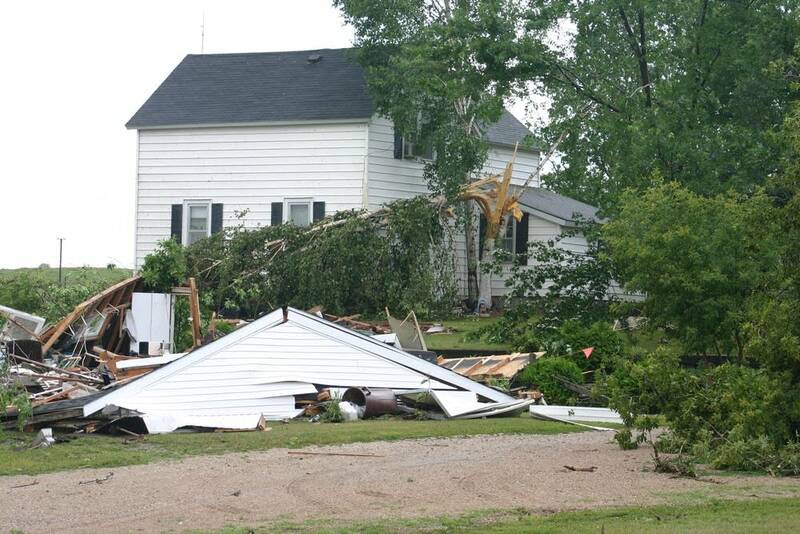 A home and an electrical transmission substation were also damaged in Swift Falls, the West Central Tribune reported. The weather service issued several tornado warnings for west-central and central Minnesota as severe storms moved across the area and reports of funnel clouds and storms with rotation came in. As the evening went on, flash flooding became the main problem in parts of central and east-central Minnesota. Some homes were reported evacuated in Staples, about 120 miles northwest of Minneapolis. Weather spotters reported 6 inches of rain between Deerwood and Aitkin and scattered flash flooding in the area.